Fits in all Nexans modular structural hardware. LANmark-7 GG45 is High Speed 2 in 1 Snap In connector which contains a full Cat6 (RJ45) Interface as well as a full Cat7 Interface using additional contacts for 600 MHz transmission. LANmark-7 offers uniquely backwards compatible services realised through an incorporated switch, which activates a maximum of 8 out of 12 contacts. For 100/250 Mhz transmission performance, the upper 8 RJ45 contacts are used, for 600 MHz the 8 contacts in the extreme corners areused. When combined with a LANmark Cat6 or Cat7 Patch cord the LANmark-7 GG45 exceeds the requirements of the Cat6/ClassE standard as well as Cat.7 / Class F (ISO/IEC/11801:2002) with considerable headroom. As such it supports all data applications defined for Cat5, Cat5E, Cat6 and Cat7 such as 10BaseT, 100BaseT, Gigabit Ethernet, 1000BaseTX, 1 Gbase TX2 over Class F, 1 Gbase TX4 over Class F, 10 gigabit Ethernetaccording draft IEEE802.3.AN, 155 ATM, 622 ATM, 1G ATM (CB1G) ..... The LANmark-7 GG45 Snap-in connector is part of the Nexans modular system and fits in all structural hardware designed for this range. 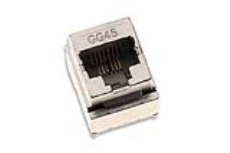 LANmark-7 GG45 is High Speed 2 in 1 Snap in connector which contains a full Cat6 (RJ45) Interface as well as Cat7 interface using additional contacts for 600MHz transmission. The LANmark-7 GG45 Snap-in connector has been designed to reach the highest performance in Cat6, Cat7 and broadcast applications (as for example ISO 15018 residential cabling). It has outstanding performance for attenuation (insertion loss), NEXT/FEXT, Power Sum NEXT/FEXT and RETURN LOSS. A metal cross inside the connector ensures the high NEXT performance in Cat6 and Cat7 mode. Excellent Return Loss Values ensure that LANmark-7 GG45 in addition to all Data applications is best suited to support CATV signals up to 1000 MHz. It is available as full- screened connector with 360° EMC protection. An optional adapter clip can be added to fit the outer dimensions of the international well-known keystone format. The LANmark-7 GG45 Snap-in is fully compliant with the current ISO Cat6 and Cat7 standard and exceeds all parameters with substantial headroom. In combination with the Nexans LANmark-6/7 product range, this connector offers you a full Class F and Class E warranted solution. The LANmark-7 GG45 Snap-in connector is a toolless connector. It is designed to be terminated by hand, without punchdown tool. For faster and easier installation of large volues, an optional comfort tool can be used.